If you read my reviews, you know I have a tendency to pick up books in a series out of order. Sometimes a book hits my inbox that I can't resist-- such was the case with this one. No, I haven't read any other books in the series, but the series has been on my TBR for a while. It was funny actually... I was enjoying the book so much, I thought about setting it aside and reading all the rest first. But I was already so engrossed, I needed to read to the end. Kitty Saves the World was an amazing read. It was fun, had intriguing characters, a quick pace, and a great plot. Kitty is now one of my favorite female leading ladies, and her mate, Ben, is equally wonderful. In fact all of the characters, including the baddies were well-written. I can't wait to go back and read all thirteen Kitty novels. Sure the plot was really interesting, but the characters were what drew me in to the point that I couldn't put the book down. I loved the supernatural radio show-- what a fun idea. I got in just at the tail end of Kitty's saga, but it seemed that Rowan spent many hours making Kitty's life difficult. The pacing of the novel was tight with lots of action-- along with plenty of information to make the plot come to life. I liked the end game Ms. Vaughn created for her bad guys-- the closing action scenes were thrilling. I really enjoyed this fun, fast-paced paranormal mystery. It's funny- when I first started reading Descendants of the Rose, I wasn't sure if I was going to like Selby. Since the story is told from her point of view, in her voice, that would be a big issue. She started out rough and gritty, but she really grew on me quickly. The cast of characters were rather quirky making this a fun story even when the subject matter became serious. And it did become rather serious, especially toward the end. Though macabre, I did like the plot, especially the link to the roses and the history of the girls' school. Selby was tough, yet soft. Yeah, I know, hard to explain. She was sarcastic, yet kind, angry, yet forgiving-- at times she was a study in conflicting emotions. She'd been hurt one too many times and preferred keeping company with the dead. In this paranormal world, ghosts have lots of power. In some ways it almost seemed better to be a ghost than living. Her best friend Helen seemed to be having the time of her life afterlife. I appreciated the fast pace. In fact there never was much of a lull in the entire story. Lots of action along with research and investigation-- all of it interesting. I'd have to say the best thing about this novel was the characters and the potential for more. They were all quite intriguing. It will be interesting to see how they grow and work together as the series continues. I'll definitely be watching for book 2. I adore anthologies. They are a great way to discover new authors. When they also benefit a fantastic cause, well you just can't go wrong. Each story in this anthology is novella length, and they are all quite enjoyable. I read it on the lanai of our vacation rental in Grand Cayman. Perfect summer reading. One thing I really liked was how different the stories were, and yet they all seemed to mesh together so well. I love a good hero, and I love to hate a good villain. Mix it all up and that's even better. The first story pulled me in with the alternating first person viewpoints- I always enjoy seeing things from multiple perspectives. I loved Ulani, the kitten shifter, along with the thrilling mystery in Cat Love. The gypsy love curse in the third novella was intriguing, making the story a real page-turner. The Only Difference had a wonderful contemporary feel to it. Number five was electric- literally and figuratively :) Breaking Through ends with a cliffhanger- I really enjoyed the intriguing plot but wish I didn't have to wait for the rest of the story. 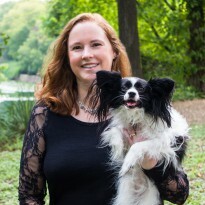 Villain was character driven with great interactions between Ember and Lanely. I highly recommend this anthology to everyone 18+ (some of the stories contain adult material). The variety of plots and characters keep the pages turning. Not to mention, all of the novellas are fast-paced and rather difficult to put down. Looking for an interesting mystery filled with suspense and conspiracy? Look no further than Secret of the Sevens.Lots of action, sweet romance, intrigue, and good old fashioned treasure hunting make this novel a winner. Talan was an amazing character- I loved that the story was from his point of view. Cocky yet sweet, confident yet vulnerable, Ms. Lindquist did a fabulous job bringing this character to life. Just enough backstory was shared to really connect the reader to him and understand what makes him tick. Talan was the type of guy I want to be friends with. I also adored the fact that despite his ADHD, Talan was presented as intelligent and capable when he set his mind to it. The budding romance between Laney and Talan was so adorable. I haven't rooted that hard for a couple in a long time. If you like secret societies, conspiracies, and kids making a difference, then Secret of the Sevens is a book you'll enjoy. This is a great novel for teen guys as well, especially since the protagonist is male. I'll definitely be recommending this one to my son. The Season of Lightning is a standalone YA fantasy set in a world that seems very similar to our historic past - circa Civil War era. I mention this because the book has a more historical feel than fantasy. In the blurb, it's compared to both Emma & Robin Hood. Well I see the similarities between Verity and Emma... Robin Hood- not so much. The Hawk had rather brutal tendencies and was fueled by revenge. He wasn't robbing the rich to feed the poor so much as decimating the rich and freeing the oppressed. Verity was a young noblewoman coming of age in a time when women were treated as pretty objects to brighten a room. It's safe to say that Verity was anything but docile. She had a sharp brain and a sharp tongue to match which drove her genteel father mad. I loved Lord Roth from the beginning. He came across so sweet, intelligent, and charming. He had his own thoughts and ideals. The Hawk, on the other hand, I didn't like very much. While I admired his commitment to his cause, the way he went about achieving his goals was rather short-sighted. I really enjoyed how Verity matured in this novel. When faced with something unpleasant, she didn't turn away but learned from it. I found her to be rather impetuous but lovable all the same. The beginning and end of the story were very fast-paced with just a tiny lag in the middle. I think my main problem in the middle was page after page of correspondence. It got tedious after a while. I found the world created by Ms. Ellison to be intriguing, but I wanted a tad more in the way of character development, especially concerning the Hawk and Roth. Overall, this is a fun YA fantasy with adventure and a touch of sweet romance. Definitely a nice diversion for a summer day. The Day Human Prince is an urban fantasy featuring day humans who live in our normal world and night humans who drink day human blood to survive. I'm torn between 3.5 and 4 stars on this novel. There were so many things I liked-- the plot was interesting, and I enjoyed Devin and many of the secondary characters. Nessa was a sidhe warrior, a night human, who bonded with Devin, a day human, to save his life. Unfortunately this was far from a match made in heaven, and the two of them set out to find a way to break the bond. I have quite mixed feelings about Nessa. I really didn't like her much at the beginning (aside from saving Devin which was quite noble). While her character did grow on me, I never felt that connection I like to have with main characters. On the other hand, I loved Devin. Strong, loyal (to a fault), intelligent-- he was a well-rounded, easy-to-love character. I loved the scenes where the sidhe underestimated him. They made for great fun. The story was unevenly paced. I would plow through certain sections, then become mired. I also felt like there was too much repetition. I enjoyed the world building and the story, as well as the myriad of fantasy characters. If I'm not mistaken, this novel is a spin-off from the Blue Eyes series. I think it might be better to read these books first. Many characters from these books were mentioned in passing, leaving me with questions. Overall, the story was enjoyable. If you like YA urban fantasy, especially stories featuring fae, then I think you'll like The Day Human Prince. Darien was a great character. After what he endured at the hands of this perfect society, it was amazing he wasn't completely damaged beyond repair. In fact I really liked all of the characters. I was prepared to despise Desiree's Protectorate-chosen mate, yet even he managed to grow on me as the story progressed. Desiree started doubting the Protectorate when she was paired with her childhood bully-- Darien's arrival and revelations merely confirmed her darkest fears. The story starts out strong, pulling the reader in, and it doesn't let go. There's really never a lull or dull moment in the story. I was so immersed in the characters and their story that I lost all track of time, devouring half the book without stopping. The ending, or lack thereof, just left me wanting the next book sooner not later. 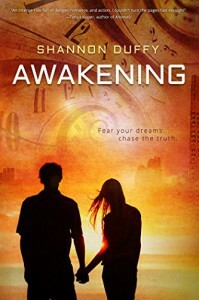 If you like YA dystopian, Awakening is definitely one to add to your TBR list. 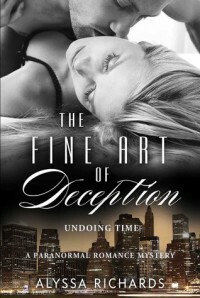 The Fine Art of Deception is a paranormal story with an intriguing mystery and a very hot romance. Main character Addie has several paranormal gifts, the most useful being her ability to get a psychic read from objects. In the beginning, the poor woman was dogged by spirits relentlessly and suffered from reliving childhood trauma. Things seemed to improve for her as the story progressed... at least the spirit visitations ebbed in favor of the single spirit important to the central plot. I enjoyed the theme of past-lives interwoven throughout the plot. I've always found reincarnation intriguing. Addie was likable from the beginning, where the reader learns of her heartache and the betrayal she endured. I felt a connection to her immediately. I liked Blake as well and enjoyed the intense romance between him and Addie. It's been a while since I read a romance this steamy. They mystery was engaging and lots of suspense kept the pages turning. While I enjoyed the quick pacing of the second half, the first was a tad slower than I like. There was lots of backstory and info about the paranormal abilities to explain, which at times was tedious. Overall, I really enjoyed this novel quite a bit. Strong characters, a good mystery, and hot romance mixed with the supernatural make for a fun read. A caveat: In my opinion, this book is suited to ages 18+ due to the graphic sexual content.